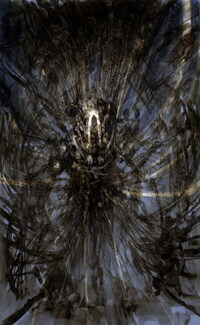 Here's a slew of Concept art from GOW and GOW2. Hope you enjoy them. I've been wanting to put some of these up for the past few years, so it feels really good to finally put some of the pieces from GOW up on line! 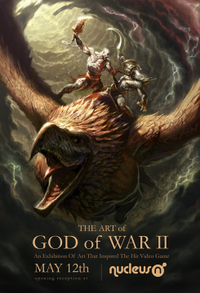 There are some other images that I wanted to show the GOW fans, but I can't find them. I'll put them up if they ever surface. I haven't exactly told anyone about this site yet, just a few friends. Part of me wants to tell everyone I know to come visit, but then, if I do that, it feels like I'm inviting everyone to a party, and as a host, I need to feed everyone and give out free T-shirts or something. Anyhow, enjoy the new images posted in "Photo Albums". Below are a couple concepts originally done for Clotho (Sister of Fate 3 in GOW2) that weren't used, but you can see some of the direction we were playing with at the time. Hope you all can make it! This will only last a couple days, so come check out our gallery show while it lasts. Ben Zhu, the director of Nucleus, was kind enought to squeeze us in between shows at the last minute. 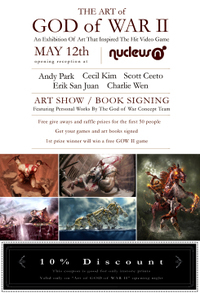 We're showing God of War 2 prints, as well as selling some personal work. And if none of this interests you, then there's the 10% off coupon and free gift for the first only on that day. Boy, I'm selling this too much, aren't I? :] --- anyway, come check it out, it'll be nice to meet you guys! This is my first blog, so please be warned since I don't know the do's and don'ts of blogging. I've never actually posted anything on line for the public. Anything I have up has been posted by the corporates, so this is kind of exciting. I've been meaning to post for ages, and finally have some head-space to do it. It's been about 6 months since I left Sony Computer Entertainment America (where God of War 1 and 2 were developed), and it's taken me a while to reflect on my time there, and where I'm heading now. I was at Sony for almost 6 years---definitely longer than any other work place I've been. These 6 years have been an amazing ride. The guys there are top-notch talent, as well as people! I made some great friends, and we created a formidable team that in turn birthed quite a franchise called God of War. If you'd asked me at the middle of God of War 1 whether it would be a hit, I'd probably have laughed it off and said that it'd be nice just to get through it alive. I focused mostly on the characters in GOW--- there were alot of creatures in the game, but we weren't trying to break new grounds in the creature design department. We wanted designs that would reach the masses. This is at times most difficult for the artists, since the designs needed to be pretty traditional, and artists tend to want to push more. The majority of the time was given to 2 important characters, Kratos and the grunts. Kratos was a particularly long search. We started from zippo... so it's sort of expected. I think... in total, it took about 2 years to finalize Kratos' design... of course it didn't take 2 years to actually design him, but the process took that long. I had done dozens of designs of Kratos, and several were actually approved, built, rigged, and animated. It was only then that my game director, David Jaffe, decided he wanted a different design. We went through designs with Kratos (actually, his name was "Dominus" at the time) being female, or even ones where he was a punker with spiky hair and boots. One of the versions of Kratos was very tribal---he was liken to an African Tarzan with freakin' long dreads that had weapons tied to the ends of them. He would swing them around, sort of like current Kratos' blades. I remember a few designs where I wanted to give this character some soft spot that he protects--- it was at first a baby on his back--- this was a bit too much, even for Dave-more-blood-Jaffe (lol), so I tried a puppy, that could actually help you, and even turn into a 3-headed Cerebus to fight along with you. This wasn't Kratos, thus the search party continued... with little to map the way! 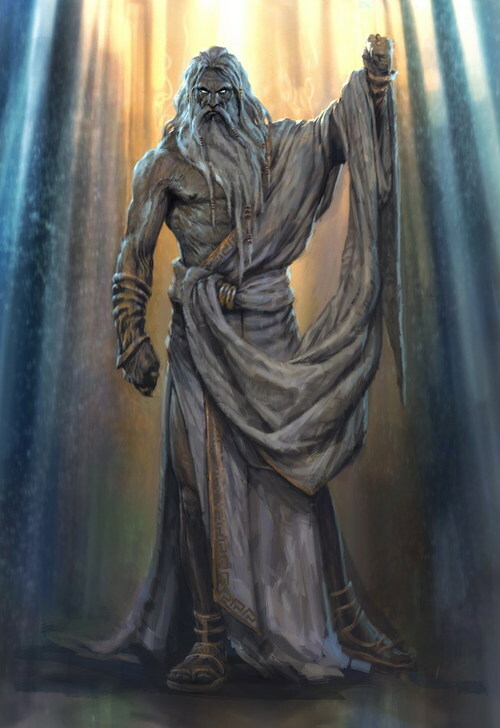 I was eating one of those sauce-dripping burgers at Carl's Junior and started to brainstorm on a napkin, thinking "what's Kratos, and what's going to distinguish him from the rest of the sword-weilding thugs that take down two headed giants for lunch, and mount the heads in the living room?" By then, Dave had already approved the bald-headed direction with tattoos. But this wasn't enough to make him Kratos. I came back from Carl's Junior with a few napkin sketches--- there was a couple I was particularly fond of--- it was Kratos holding two chains with large axe-like blades attached to the ends. When Dave saw this, he liked it, but was unsure how it would look and play. I spent the next days trying to ensure him with sketches of Kratos jumping around and fighting with both blades attached. I was keeping my fingers crossed, as we were testing this out in animation to see if we could make this work. We'd been here before, so I didn't want to get my hopes up. After weeks had passed, Dave was no longer asking for more different versions of Kratos---then he asked me to start thinking about colors and refining the tattoo on Kratos--- I felt myself sink deeply into the expensive but aweful chairs we had (we complained about the chairs, but the "chair rep" came in the studio to let us know that the chairs were good, and we just didn't know how to sit properly :) I enjoyed that moment thoroughly. During crazy days (the work until you can't recognize your family days), I remember only thinking about finishing the project and taking a long break, a loooong break...maybe take on a new hobby, like say...big toe wrestling (maybe that was during the crazy days), but at least work on a book or film, or a nice sabatical in Florence. It all sounded amazing (except for the big toe wrestling, maybe), but the last thing I wanted to do was to spend another 2 and a half years developing another God of War game. But... I would get to build my own Visual Development team, and be in a position to try to change areas that I thought could improve from the first game... I had alot to think about during the long break, as did many others.